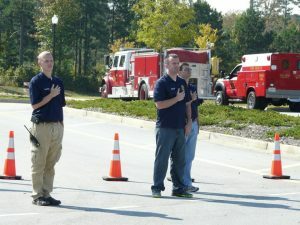 Being a part of Paulding Public Safety Appreciation, Inc. has been an incredible honor. The new President and the executive board have taken things to new heights and I couldn’t be prouder.Last night President Keith Thomas and Vice President Christina Kelly, along with the PPSA board presented previous President Joseph Gullett (now State Representative Joseph Gullett) with a Plaque and Gavel for his dedication to serving Paulding Public Safety as President from 2013 through 2018. During this time he work tirelessly to move this board to the next level by raising money to help Public Safety members in their time of need! President Keith Thomas stated that "it was an honor not only to serve but stand beside Joseph Gullett and he had big shoes to fill but that he was thankful to Mr.Gullett for paving the path to what a great president should be!" Before we adjourned last night for Sine Die, HB 458 passed out of the house and is now waiting on the Governor's signature. This legislation restricts the use of firefighting foam during testing and training due to the dangerous PFAS substances that cause harm to the environment. In the coming days, I look forward to sharing updates and a final recap of the session, but today, I simply want to say thank you. I take seriously the trust voters have placed in me, and I'm humbled and thankful for your continued support. Joseph Gullett is a conservative leader who has done the work of making Paulding County a better place to live. Joseph grew up in Gwinnett County and was raised in a family that encouraged conservative values, the importance of education, and an excellent work ethic. Joseph attended Columbus State University. Two important things happened in his life at Columbus State. First, he began working for SunTrust Bank. He continues to work for SunTrust to this day leading a multi-million dollar project that ensures federal regulatory compliance requirements are met. Second, and more important, Joseph met his wife, Jessica. Grassroots activism has long been a part of Joseph’s life. In the early 2000s, Joseph began working with leaders in the national FairTax movement. In his spare time and using his own finances, he built and maintained a pro FairTax website that enabled voters to easily contact their Congressmen in support of this legislation. He continued to develop resources to encourage grassroots lobbying and even hosted a FairTax rally that drew supporters from as far away as North Carolina and Florida. Joseph has a passion for serving his community. 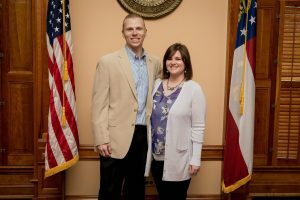 When he and wife Jessica put down roots in Paulding County, he immediately began finding ways to be involved with volunteer organizations as well as the local Republican Party. He joined campaign teams for national, state, and local elections. Before long he had taken on leadership roles in the Paulding County GOP, serving as Chairman from 2011 to 2013. During his Chairmanship, Joseph helped oversee and coordinate the Back Pack Program, a local initiative that provides food to children who would otherwise go hungry on the weekends. Under Joseph’s leadership, the Paulding County GOP began awarding college scholarships to budding young conservatives in the community. Over $2,500 of privately raised funds were given to graduating Paulding County seniors. Joseph has been elected as a delegate to county, district and state GOP conventions since he first joined the Paulding County Republican party. In fact, Joseph’s passion for conservative causes took him all the way to the 2012 Republican National Convention where he had the honor of serving as an alternate delegate for the state of Georgia. That year he also worked alongside Congressman Tom Graves to open Paulding County’s own Victory Center to serve as a headquarters for the Romney campaign. Joseph’s community involvement stems far outside of the Republican party as well. One of his proudest accomplishment is helping to found and grow Paulding Public Safety Appreciation, Inc. Joseph has been on the Board of Directors for PPSA since its inception. He has had the privilege of working to build it up from its humble roots to the strong community partner it is today. Joseph has served as the President of PPSA’s Board of Directors, during which time the annual “Run with the Badges” 5K Glow Run was established. Heading into its fifth year, the Glow Run hosts approximately 1,000 runners and has become a community wide event providing family friendly activities and vending opportunities for local businesses. PPSA exists for the sole purpose of aiding the county’s public safety officers and first responders in times of need. Since the organization was first formed, it has raised over $130,000 and given out $70,000 in financial assistance. Joseph invests his time and energy into Paulding County. His community involvement includes serving on the Chattahoochee Technical College President’s Advisory Council, as well as serving on the Board of Directors for the Paulding Boys and Girls Club. His ongoing work in the community has earned him the Presidential Volunteer Service Award from President of United States for six consecutive years. He is honored to have been appointed to the Paulding Comprehensive Transportation Plan committee. As member of the committee, Joseph helped to create a 25 year transportation plan adopted by the cities of Hiram and Dallas as well as the Paulding County Board of Commissioners. In 2015, Joseph was appointed by the legislative delegation to serve on the Paulding County Board of Elections. There Joseph has worked hard to make the county’s voting process as secure as possible, looking for ways to prevent voter fraud. In furtherance of his personal values, he became active in the Paulding Right to Life organization, even participating in the annual March for Life at the state capitol. Because Joseph values the 2nd amendment, and because he is a gun owner himself, he joined the Georgia Carry Association. As a member of the GCO, Joseph has been able to keep current on state legislative issues regarding the right to carry.